The irradiated Commonwealth of Fallout 4 is an often hostile environment, and not just thanks to the ghouls, deathclaws, and super mutants who call it home. So what better way to approach the place than in a suit of working ODST armor, which keeps Halo’s Orbital Drop Shock Troopers safe and cool on the nastiest of planets? 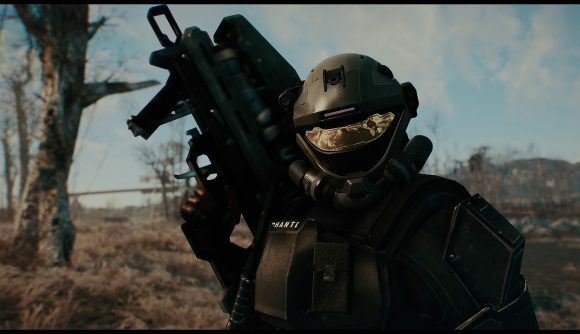 A team of modders has made three suits of ODST armor usable in Fallout 4, and they look extremely sharp. They’re customizable, and have the kind of stats you’d expect from a far-future space-borne special forces kit: protection against ballistic and thermal weapons, plus climate control for extreme environments. The mod, which you can find for PC over on NexusMods, includes the three ODST armor sets and four helmets. You can customize the skins, visor colors, glow colors, and HUD, and even write your name on the chestplate. The armors have multiple variants and come with several optional attachments, like night vision. What’s extra neat about this mod is that it doesn’t just plunk Halo armor into the game and set you running around with it straight away (unless you want to, of course). The modders have built a new area under the Castle where you can find the new gear – it’s guarded, naturally, but there are also new secrets and lore to discover along the way. There are a couple things to be aware of when installing the mod: First, you’ll also need the Fallout 4 Script Extender and Scrivener’s HUD Overlay Framework (if you want to use the custom HUDs). Second, you’ll want to have a character with a fairly thin body shape to avoid stretching the new ODST models out. The Nexus page has ideal points on the character creation triangle for both male and female characters for reference. Once you’ve got the mod installed, you can either head to the Castle to search for the new gear, or alternatively build it yourself at the new ODST HoloBench that it adds to the game.